If you’ve ever listened to an acapella quartet or a beautifully orchestrated symphony, you understand harmony. The harmonious interaction of voices and/or instruments leaves you uplifted, enchanted, and peaceful. There are no harsh sounds that prick your nerves and make you cringe… at least, not when all performers work together for the delight of the audience. And that requires well-coordinated teamwork. Did you know that you can have that same kind of harmony in your family? One that promotes peace, happiness, and enjoyment. More specifically, you can have a harmonious and enriching connection to your child. Positive Parenting – What Is It? Positive parenting promotes peace and harmony between parent and child. It is based on the parent’s deep love for the child which, in time, resonates back to the parent. They commit to being an example of regulating their own emotions. They see themselves as a coach rather than a boss, offering loving guidance to their child instead of being controlling. In turn, this helps their child learn to manage their own emotions and behaviors. They put the maintenance and strengthening of their connection with their child as a priority, motivating the child to cooperate instead of demand it. Now, you may be wondering how this all works out in practice. Understand this: Discipline is not synonymous with punishment. To discipline a child means to guide them, to teach them, to show them by example… and, at times, allow them to feel the consequences of their actions. But in no way does it imply being a harsh ruler. Only through positive and loving discipline can your child develop their own self-discipline—the ultimate goal. How can you guide them there? Consider some tips that will help you create a loving and harmonious parent-child connection that will yield long-term peace in your family. 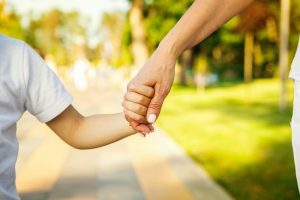 Keep these seven points in mind to succeed with a positive parenting approach. Tip #1: Treat your child with love, and they’ll learn to love themselves. Ironically, when you treat your child harshly, they never learn to manage their own discipline in a constructive way. But when you lovingly discipline your child, with firm but reasonable limits, they will learn to set appropriate limits for themselves later in life. In other words, you guide your child in a positive and loving way, they will learn to treat themselves the same way. Tip #2: Learn to regulate your own emotions… first. Only when you make the effort and learn how to manage your own emotions can you teach your child by example. You can lecture them a million times about keeping their emotions in check, but if you don’t become a living example of patience and emotional generosity, you’ll be spinning your wheels. Remember, actions speak louder than words! Tip #3: Weight everything you teach—does it strengthen or weaken your relationship with your child? Effective discipline requires that you have a close bond with your child. When your child feels connected to you, they are much more inclined to listen to you. More even, if you show empathy and love as you guide them, you’re helping your child to truly understand that you only want the best for them. In turn, that allows them to focus on improving their own behavior instead of rebelling. Tip #4: Set firm limits, yes! But do so with compassion. Positive parenting does not mean promoting anarchy. You still need to set rules and enforce them. The difference is that you need to show empathy and understanding for your child’s point of view. When they feel acknowledged and see that you don’t just brush aside their perspective, it’s easier for them to accept the limits you impose. Tip #5: Correct your child by first confirming your love and connection. In most cases, a child misbehaves because they either feel bad about themselves or disconnected from you. So, before you begin correcting them, take a moment to reaffirm your bond. This can mean, among other things, putting your hand on their shoulder, softly patting their back, making loving eye contact with a smile, picking them up or lifting them on your lap, kindly taking their hand in yours, or lowering yourself down to the level of your child’s eyes. Tip #6: Allow natural consequences to be the teacher, not consequences you create. Naturally occurring consequences can be a terrific tool for your child to learn from their experiences. For example, if they don’t study for a test and then fail it. However, when you engineer the consequences, that often has the opposite effect because your child will most likely see your “consequence” as a punishment and react accordingly. Instead, let life be their teacher. Tip #7: Avoid being pulled into a power struggle. How? By assuring your relationship with your child remains strong. If you’re confronted with defiance, don’t allow the situation to become a power struggle. That will only deepen the rift between you. And rather than sending them off to their room or into a timeout, try to evaluate why there’s a disconnect and how you can reconnect with your child. Obviously, positive parenting takes time, effort, and willingness to approach discipline in a more loving way than you perhaps received it as a child. But remember, with patience, your training will not only lead you to a harmonious bond with your child now, you will also help set a life-long legacy of peace and harmony in motion that can be passed on from generation to generation.